Recognizes a carbohydrate determinant of Gal 1-3(Fuc 1-4) GlcNAc which is blood group antigen Lewis A. Recognizes a carbohydrate determinant of Gal 1-3(Fuc 1-4) GlcNAc which is blood group antigen Lewis A. It is present primarily on epithelial cells such as colon and kidneys. 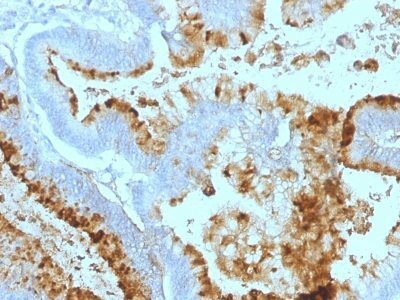 In the tumors and dedifferentiated tissues, decrease of Lewis A antigen was observed. Lewis A (type 1 chain) is expressed in colonic epithelial cells and may be useful for detection of gastrointestinal tumors, pancreatic cancer, and colorectal tumors. Blood group related antigens represent a group of carbohydrate determinants carried on both glycolipids and glycoproteins. They are usually mucin-type, and are detected on erythrocytes, certain epithelial cells, and in secretions of certain individuals. Sixteen genetically and biosynthetically distinct but inter-related specificities belong to this group of antigens, including A, B, H, Lewis A, Lewis B, Lewis X, Lewis Y, and precursor type 1 chain antigens. Catalog number key for antibody number 0311, Anti-Lewis-A (7LE) The prefix indicates conjugation, followed by the antibody number and size suffix.